Not just for chronic back pain, ultrarunner’s backs need loving too! "Love the wheel, use it before and after runs to help with decompression. The wheel is also wonderful for stretching the sacrum and opening the shoulders after long runs. " "I was skeptical as a big guy that one, it would hold my weight and two, that it would relieve my back pain. Previously I would have my 16 yr old walk on my back daily. Using the large, gentle wheel, I've never felt better. I use it daily now to stretch my back out more so for preventative then pain relief. This product works as described and is worth its weight in gold. " "I bought the large (gentle) wheel for my wife, who sits at a desk most of the day and comes home complaining of back pain. After using the wheel for just a few days, she says she already has noticed a significant improvement! I also have started using it, and we both notice days when we have not used the Plexus Wheel, it makes that much of a difference! Although it took longer to arrive than I had hoped (a little over 2 weeks), I would highly recommend this product to anyone! " "I have cervical radiculopathy in the upper spine/neck which is severely painful. This seems to give me relief. I don’t use it near the neck quite yet but seems to be helping with regular use. Even if I did not have the pinched nerve in my neck I still would use this just to relieve the stress on my spine from daily life. It does help with sleep as well. Very healthy item. Prefer this over the ball. Gets right in to the muscles next to the spine. Plus smaller storage footprint vs the ball. Love it!" "They’re not good for using on a tricycle but they are fantastic at loosening up your back muscles and ifocnf you some much needed relief. " "My job requires me to stand 90% of my day, frequently with my head down - so you can imagine the neck/shoulder situation I have going on. The Plexus Wheel is awesome, it feels good enough to make me WANT to use it daily rather than feel like I need to. I only wish a 2 wheel bundle was an option (I haven’t used the gentle pressure wheel more than the very first time I rolled out). Overall I would highly recommend, I normally wouldn’t spend this much on this type of thing, but this one was worth it. " "This piece is just what my neck and back ordered. After struggling with the two tennis ball taped up thing my trainer made, this works on all surfaces and really gets in deep. Its just what I needed to keep making progress." "It works great. I have sciatica down my left leg and it is alleviated now. I highly recommend this product"
"I've been using the wheels for 3 weeks now, at least 5 nights out of the week. My lower back hasn't felt this limber in years. After a 5 min session I feel like jelly in a good way, the medium size is my favorite as the muscles have loosened enough now that it actually pops and adjusts my spine as a I roll. I'm actually taking mine into work so coworkers can try it after they have seen how much better I feel and are interested in getting their own set. I recommend it to anyone who doesn't constantly bending over at work, it has made a world of difference for me. " 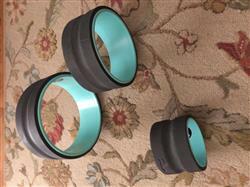 "I ordered the medium size wheel and I’m so glad I did. It has significantly improved my back pain. At first I wasn’t sure but I’m so glad I bit the bullet and ordered! Greatest purchase ever! " "The Churp is excellent for stretching out the spine. I am going to try the deep tissue next. Overall this is a fantastic product that a lot of people could benefit from. " "I love my wheels! I recently purchased the newer version with the grip in the middle- and I love it. I use it almost everyday and encourage any clients of mine who sit at a desk or drive a lot to use them as well! Love! Love! " "Love these wheels! Great stretch, back fix and great back stress release!" "This product worked way better than I had anticipated. On the very first use I could feel a deep massage and relief as my back cracked. So happy I purchased this and am considering purchasing more sizes!" "Both my husband and I use them daily. We’ve had them for 2 weeks and notice a huge improvement in back pain. My neck feels great too!" "I love the 6" Deep Tissue Plexus Wheel!!!" "This does what is says. It contours to the spine allowing a greater stretch. My vertebrae immediately start adjusting into their proper spot once I begin to roll,"
"Easy to use, and helps cracking my back and opening me up. Still learning but what I have done so far is wonderful! Already shared it with my children. " "My back has never felt better!!!" "First time I used these I cracked everywhere I needed to. No more bear hugs and uncomfortable twisting, pushing and pulling. I had an inversion table but I always got sick when i used it. These are amazing. I have only used the largest wheel but can see myself using all three over time. Amazing!" "I love the Chirp Plexus wheel! My wheels arrived before expected. I've been using it every night and I can already feel the difference. It is loosening my back and neck muscles. The wheels have helped me have better form when getting into my yoga poses and even when I am weight lifting. I hope to get some for my father, to help him alleviate some of his back pain." "So so good. So so good. Instant and obvious pops and crackles and shifts and relief. For me, my husband, my dad, my friend... So good." "I feel the pops in my spine and stretch as I roll on these wheels. I've never felt that on other rollers. This is one of my favorite recent purchases hands down." "Beyond expectations. Not sure about shipping delays I got mine in 6 days including weekends. " "They are awesome! I bought a set for my daughter and she loves them!" "I use this every day, multiple times a day and my back snap, crackle and pops every time. I got the 3 so I could take one to work during my rotation to night shift. Love it." Get Ready For A Happy Back! "I bought the three pack. The smallest, deep tissue is my favorite for relieving stress. The big one is great for stretching. The middle one is fine, but for the savings, you might as well get all three. "